Barbie for the NES is more of a platformer. Each level is a "dream" and each "dream" has Barbie walking left to right while avoiding obstacles or else her "Zs" will drop and she will have to replay the level, or sometimes restart the entire game. Barbie can request help from animals by pressing SELECT to choose what the animal should do and then pressing B to throw the command. If the command reaches the animal, the animal will do the command requested. Sometimes "Bosses" will appear, these "Bosses" are usually defeatable with the help of an animal. 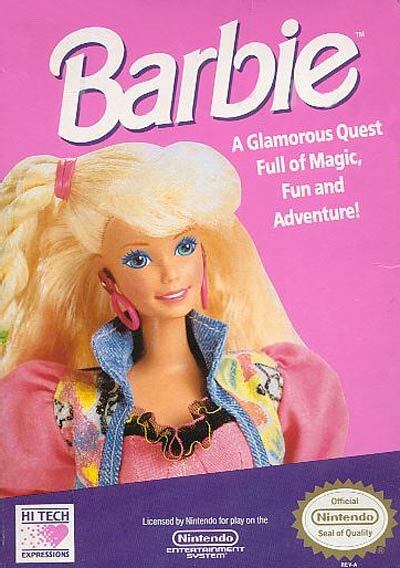 According to the box art, it's "a glamorous quest full of magic, fun and adventure!" Whoo hoo! Go Barbie! Prevail in the name of plastic women everywhere!